Learn something new every day! 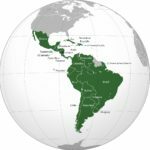 Below you can find a list with all the current Latin American countries and their capitals (2019). I hope you find the information interesting. The term “Latin America” ​​is defined by the Royal Spanish Academy as the set of American countries in which the majority of the languages ​​spoken come from Latin (specifically Spanish, Portuguese and French) or as the set of countries of America that were colonized by Latin nations (Spain, Portugal and France).r1, r2 and r3. Puerto Rico (US) and French Guiana (France) are not sovereign countries. Royal Spanish Academy – Diccionario panhispánico de dudas (2019). Latinoamérica. Text in Spanish. Avaliable [HERE]. Royal Spanish Academy – Diccionario de la lengua española (2019). Latinoamericano. Text in Spanish. Avaliable [HERE]. Saberespractico.com (2019). Países de América Latina. Text in Spanish. Avaliable [HERE]. Heraldry (2009). Orthographic projection of Latin America. Original map avaliable [HERE]. PhD in Education. From Spain. Living everywhere. Passionate about learning and sharing. Welcome to Learner Trip! © 2019 Learner trip. All rights reserved.